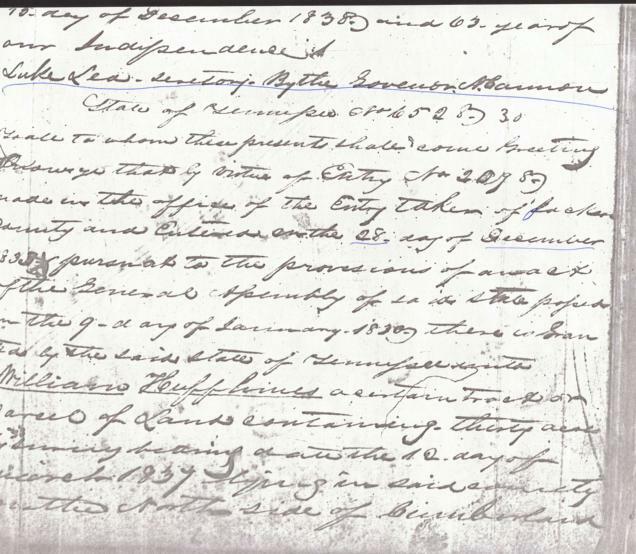 To all whom these presents shall come, Greeting: Know ye, that for and in consideration of the sum of twelve and one half cents per acre, paid into the office of the Entry taker of Jackson county and entered on the 3rd day of July 1824 pursuant to the provisions of an Act of the General Assembly of said state, passed on the 23d day of November 1823, by No. 254. 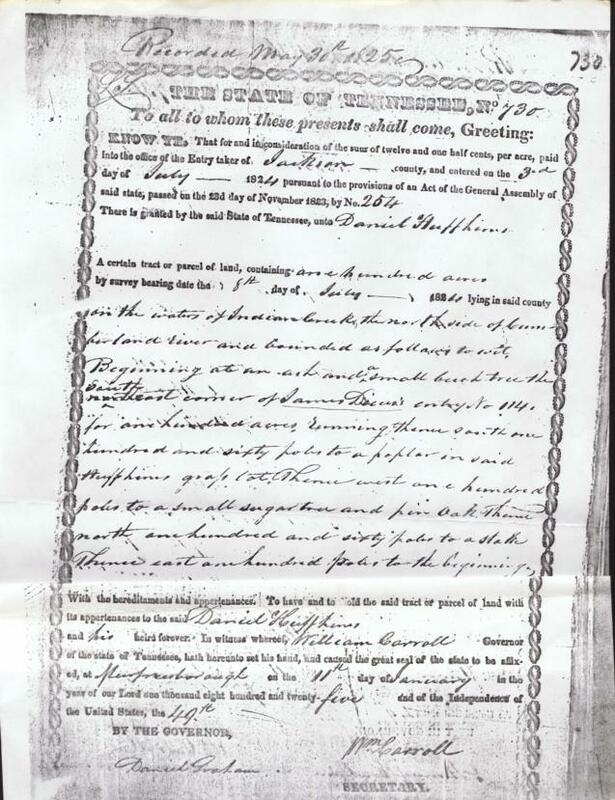 There is granted by the said State of Tennessee, unto DANIEL HUFFHINES a certain tract or parcel of land, containing one hundred acres by survey bearing date the 8th day of July 1824 lying n said county on the waters of Indian Creek the north side of Cumberland River and bounded as follows. To wit: Beginning at an ash and a small beech tree the southeast corner of James Dicus's entry No. 114 for one hundred acres running thence south one hundred and sixty poles to a poplar in said Huffhines' grass lot. Thence west one hundred poles to a small sugar tree and pin oak. Thence north one hundred and sixty poles to the beginning. With the hereditaments and appertenances. To have and to hold the said tract or parcel of land with its appertenances to the said DANIEL HUFFHINES and his heirs forever. In witness whereof William Carroll, Governor of the state of Tennessee, hath hereunto set his hand and caused the great seal of the state to be affixed at Murfreesborough on the 11th day of January in the year of our Lord one thousand eight hundred and twenty five and the the Independence of the United States, the 49th. To all to whom these presents shall come, Greeting: Know ye that by virtue of Entry No. 1704 made in the office of the Entry taker of Jackson County and entered on the 31st day of March 1831 pursuant to the provisions of an act of the General Assembly of said State passed on the 9th day of January 1830, there is granted by the said state of Tennessee unto WILLIAM HUFFHINES a certain tract or parcel of land containing twenty five acres by survey bearing date the 7th day of September 1836, lying in said county on the north side of Cumberland River and on the waters of Indian Creek. 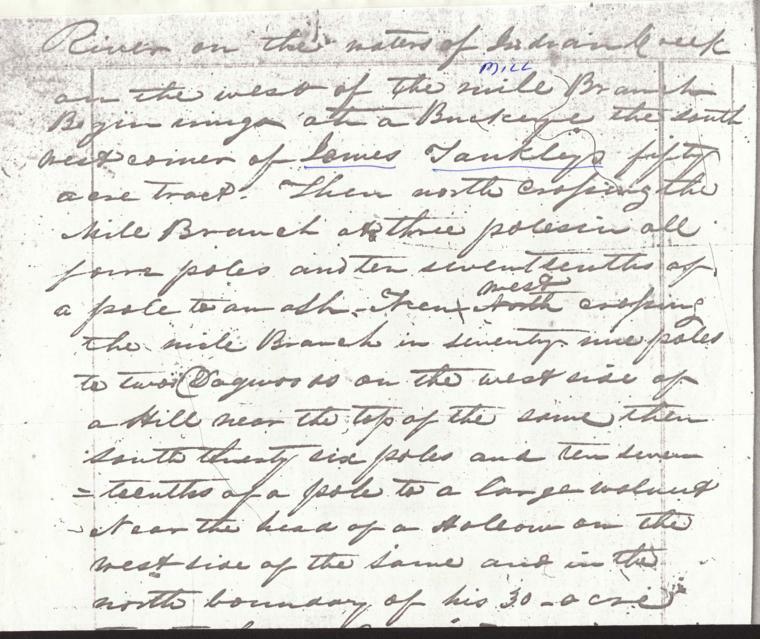 Beginning at a beech the southeast corner of his a survey of 80 acres - then north with the east boundary of said survey 80 poles to a hickory and a sugar tree near the top of a ridge. Then east fifty poles to a Beech maple and dogwood pointers, east of a hill. Then south 80 poles, crossing a hollow above the heirs of Bullard's Creek to a stake, sugar tree, black gum and small dogwood pointers, south of a hill. Then west fifty poles to the beginning. 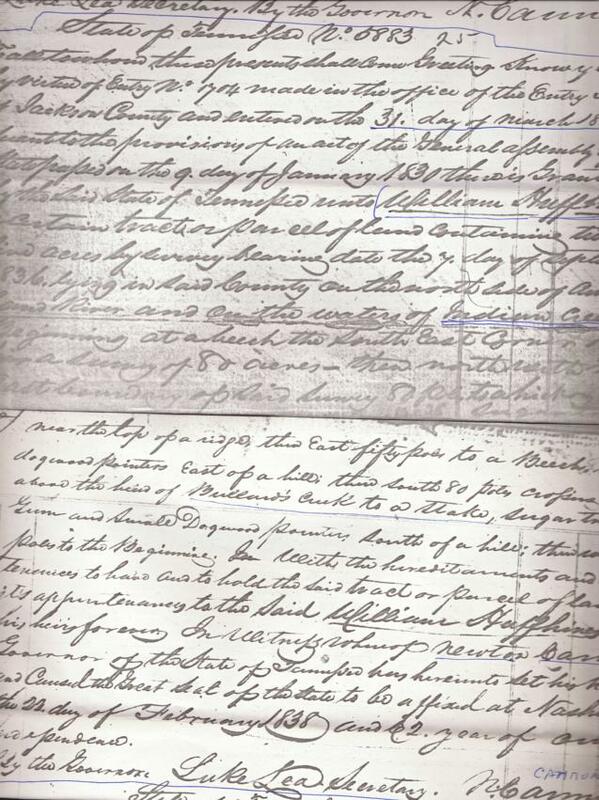 With the hereditaments and appurtenances to have and to hold the said tract or parcel of land with its appurtenances to the said WILLIAM HUFFHINES and his heirs forever. In witness whereof Newton Cannon, Governor of the State of Tennessee has hereunto set his hand and caused the Great Seal of the state to be affixed at Nashville on the 22nd day of February 1838 and 62nd year of our Independence. To all to whom these presents shall come, Greeting: Know ye that by virtus of Entry No. 1705 made in the office of the Entry taker of Jackson County and entered on the 31st day of March 1831, pursuant to the provisions of an Act of the General Assembly of said state passed on the 9th day of January 1830, there is granted by the said state of Tennessee unto WILLIAM HUFFHINES a certain tract or parcel of land containing twenty five acres by survey bearing date the 12th day of March 1837 - lying in said county on the north side of Cumberland River on the waters of Indian Creek on the west of the Mile [Mill} Branch. Beginning at a buckeye the south west corner of James Tankley's fifty acre tract. Then north crossing the Mile Branch at three poles in all five poles and ten seventeenths of a pole to an ash. Then west crossing the Mile Branch in seventy nine poles to two dogwoods on the west side of a hill near the top of the same. Then south thirty six poles and ten seventeenths of a pole to a large walnut near the head of a hollow on the west side of the same and in the north boundary of his 30 acre tract. Thence east with said line forty three poles and Six seventeenths of a pole to a beech corner of said tract. Then south with said tract 8 poles to a yellow wood corner of said Huffhines 80 acres tract. Then east with the line of said tract thirty six poles to a stake in the west boundary line of Jame Tanksey's fifty acre tract. Then north with said line forty poles to the beginning. In witness whereupon Newton Cannon, Governor of the State of Tennesse has hereunto set his hand and caused the Great Seal of the state to be affixed at Nashville on the 12th day of November 1838 and our 63rd year of our Independence. To all to whom these presents shall come, Greeting: Know ye that by virtue of Entry No. 209 - 8c made in the office of the Entry taker of Jackson County and entered on the 8th day of December 1838 pursuant to the provision of an act of the General Assembly of said state passed on the 9th day of January 1830, there is granted by the said state of Tennessee unto WILLIAM HUFFHINES a certain tract or parcel of land containing thirty acres by survey being dated the 10th day of March 1837, lying in said county on the North side of Cumberland on the water of Cumberland River and on the north side of the same and on the waters of Indian Creek. Beginning at a hickory and hornbeam northeast corner of said Huffhines' twenty acre tract. Thence west with said tract fifty three poles and one third to a Beech on the Bank of Indian Creek. Thence north with Travis Draper's tract ninety poles to a Beech on the east side of a hill. Thence east fifty three and one third to two Beeches on the east side of a hill. Then south passing the corner of said Huffhines' old tract in all ninety poles to the beginning - with the hereditaments and appurtenances to have and to hold the said tract or parcel of land with its appurtenances to the said William Huffhines and his heirs forever. In witness whereof Newton Cannon, Governor of the State of Tennessee has hereunto set his hand and caused the Great Seal of the state to be affixed at Nashville on the 8th day of December 1838 and 63 years of Am. Independence. Tennessee Smith County Circuit Court, Apr Term 1823. 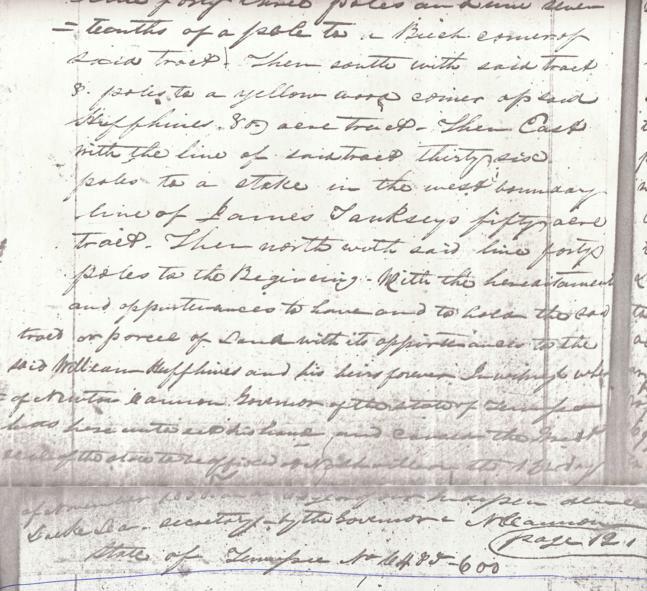 Then the execution of the within deed of conveyance from John Teel to Daniel Huffhines for 65 acres of land was duly acknowledged in open court by said John Teel and ordered to be certified for registration. Test: Will Hart, Clerk. 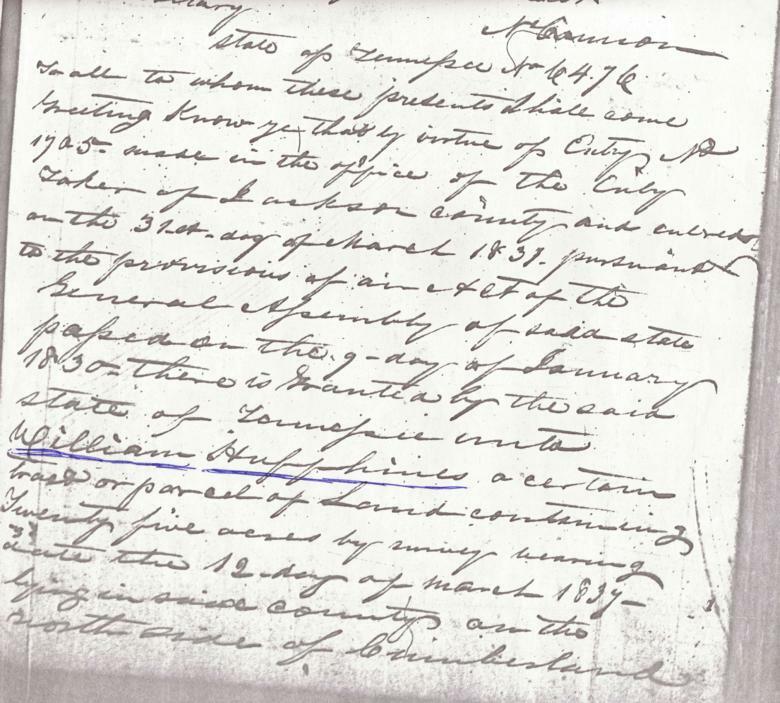 Registered 15 Apr 1823, David Burford, Registrar of Smith County.